I participated in the Iowa Ornithologists’ Union field trips this past weekend. These were run in connnection with the fall meeting of the IOU at Neal Smith Prairie Preserve near Prairie City. On both days I elected to participate in the field trip which “walked” the prairie in search of Smith’s Longspurs, Lapland Longspurs and the various sparrows (e.g., the Emerizinae Subfamily) that can be expected in central Iowa in late October. No Smith’s Longspurs were seen, probably because they have not gotten this far south yet. A few Lapland Longspurs were observed in flight. The sparrows were a better story. The best observations were of LeConte’s Sparrows. We saw several each day and they made themselves very obvious by coming within a few feet of the group and posing close-by on whatever little stalks or twigs that they could find. The photographers in the group were especially ecstatic. Everyone remarked that never before had they observed so many LeContes at such close and sustained range. Clearly, they were the highlight for many of the birders, including me. The other sparrows that I was able to identify were: White-throated, White-crowned, Savannah, Vesper, Swamp, Song, Fox, Lincoln’s, Harris’s, Field and Juncos. Some other particpants reported finding a Clay-colored, one or two early Tree Sparrows, and a late Grasshopper Sparrow. Oddly, I do not recall if anyone saw any Chipping Sparrows, and I would have thought they would still be present. Another less surprisingly absent (I believe) species was Nelson’s. Henslow’s, which are now quite common at Neal Smith in summer, were all gone. Nor, as I recall, did anyone see a Lark Sparrow. It looks like a good year in Iowa for the northern finches. A fair number of Pine Siskins and a few Purple Finches were observed. The first and second southward migration waves have passed through central Iowa. We are now on the last phase. Now present in big numbers are Yellow-rumped Warblers, and sparrows of various sorts. I was standing quietly in my back yard woods this morning when a Woodcock flushed about 30 feet from me, flew across the ravine and fluttered to a landing about 60 feet away, in plain view. It was a nice way to end an otherwise uneventful morning of birding my yard and surrounds. Juncos, White-throated Sparrows, one Orange-crowned warbler, and one Brown Creeper rounded out the morning. Of course, many of the usual customers were around, but I will not bother to list them. Yesterday I drove to Rock Creek Park, about 45 miles from here, to try to locate the Red Phalarope reported on the Iowa Bird Line. It was easy. The Phalarope was very cooperative and in plain view all the time I was there. This was my new Iowa Life Bird for the fall: number 321, lifetime Iowa. I must confess that I prefer to see Red Phalaropes in breeding plumage, when their name is deserved. The “fall” or “basic” plumage of gray and white gives no clue that this is really a Red Phalarope. But, I’ll take it given that I have never seen one in Iowa in breeding plumage. Several other species were feeding on the mud flats north of F27 at Rock Creek, i.e. : 30 Kildeer, 15 Snipes, 12 American Pipits, one Greater Yellowlegs, one Pectoral Sandpiper and one Semi-palmated Sandpiper. Most of these were first of the year for me. The weather and the lighting were wonderful, so the trip was an unmitigated success. Friday, February 5 Ready to go to the airport at 6:00. Flight was late, but we had extra time in Delhi before going on to Amritsar. We arrived in Amritsar about 30 minutes late and there was no one there to meet us. Another guide called our hotel for us and we were told the car would be there in 10 minutes. When they arrived, the young woman said she was late due to traffic, but the lady at the hotel said they were late because the flight is always late and they didn’t think we would be there so soon. This was our first and only hitch with AK. It was getting late in the afternoon, and they did not want to take us anywhere because no guide was available. 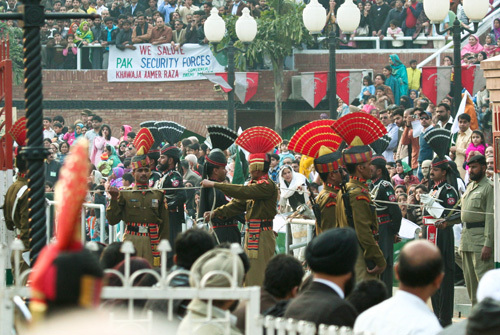 After a bit of discussion, they arranged for our driver, Sam, to take us to the Wagah Border with Pakistan to see the daily evening closing ceremony. [Normally drivers are not given that much responsibility without a guide present]. It was such an event! There was big cheering on both the India and Pakistan sides. “Long live Hindustan” and “Long live Pakistan” rang out from the crowds in support of their respective countries. It was very ceremonial and quite pointless, with soldiers in fancy dress strutting up and down the road to the border crossing to embellish the closing of the gate for the night. It reminded us of the Ministry of Silly Walks. We were very glad that we had insisted on coming here tonight. Back for dinner at our hotel. The food was not very good, but we enjoyed the company of a couple from Switzerland, the only other guests at the hotel that night. At 9:00 p.m., our guide, who had been previously occupied during the day, showed up to take us to the night ceremony at the Golden Temple of the Sikhs. What a gorgeous sight, especially at night. 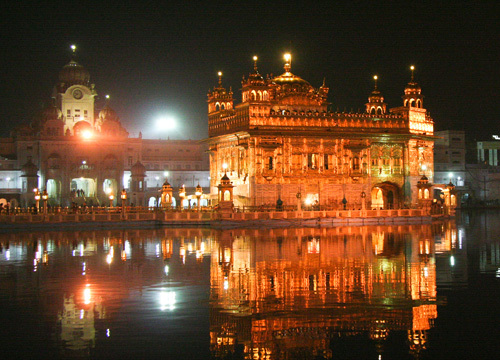 Saturday, February 6 Back in the morning with our Amritsar guide to see the Golden Temple by daylight. It is our first cloudy day, but still nice. We entered the Temple area after leaving our shoes and socks and washing our feet in the shallow foot bath in front of the entrance to the Temple area. This is the holiest of Sikh shrines. It was amazing to see the 24-hour kitchen which feeds 30,000 people, for free, every day. All work is done by volunteers. We went into the Temple to see a priest reading from the huge, Sacred Book. 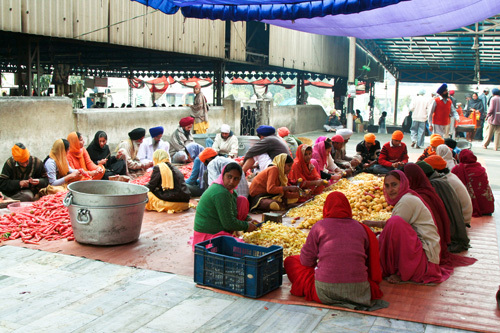 Many Sikhs were in prayer. The Temple is even more beautiful inside than out, but no photos are allowed. We finished our tour of the area by seeing the “bed” where the smaller holy book stays throughout the day. We walked through some old city streets to see the memorial park where the British fired 1600 rounds at a gathered crowd 100 years or so ago, killing and wounding many, and abandoning them where they lay. Back to check out from our hotel and on to the airport. This was our least favorite hotel. It is a very old eclectic place featuring aromatherapy, and not much else, for the guests. It is probably cleaner than it seems but just not our style. We were dropped off at the airport. Another glitch: our tickets were not changed to show we were leaving Amritsar for Delhi today instead of tomorrow. Fortunately, the airline representative was able to finally change our tickets, and we were on our way. We were met at the Delhi Airport by our AK representative and taken to the Delhi Oberoi Hotel. We drove though Embassy Row on our way. Lots of parks and green space. This is a very nice hotel and a welcoming complimentary bottle of wine awaited us, (Delhi is a bit more cosmopolitan than the other places we have been). We enjoyed a very nice Italian dinner at the Italian restaurant in the Hotel: gnocchi with walnuts and raddicio, chocolate lava cake for dessert. Sunday, February 7 We started early. Our guide, Jaibir, took us to see both old and new Delhi on a whirlwind tour. We started in Old Delhi by seeing the Red Fort built by Shah Jahan. It is a large area of mostly red sandstone. 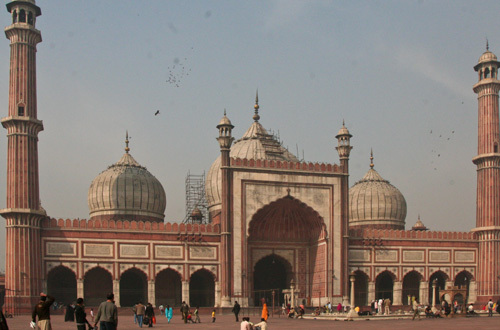 Then to Jama Masjid which is still the largest mosque in Asia. All women get a large cover to wear. We took a very fun ride in a rickshaw through the narrow streets of Old Delhi. On we go to the park where Mahatma Gandhi’s ashes are buried. Next stop is Humayun’s Tomb, which was built by Humayan’s wife in his honor. Red Sandstone and white marble. Lots and lots of school boys are there for a cultural field day. 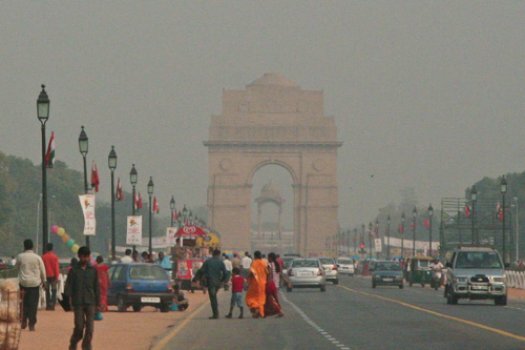 We take a drive by the big, beautiful area of the President’s house and other very large government buildings leading to India Gate, built to commemorate those Indian soldiers who died in World War I. The last stop is in South Delhi to see the Qutb Complex, begun in 1193. 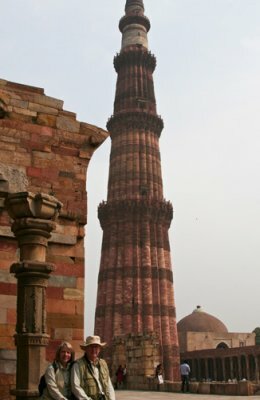 The minar is 250 feet high with intricate carvings. Buildings around it have carvings similar to those at Khajaraho. The iron pillar in the court yard is from the 4th century. Last stop is Lakshmi Narayan Mandir, a newer, yet ornate Hindu Temple. Even a nice shop next door to where we left our shoes. Back to the hotel for Barbara to pack up and rest. We had a light supper after such a big lunch. Nasheef, the AK representative, was very helpful at the airport. There was a very long line at the passport check, but all went fine, with plenty of time. Monday, February 8 The flight actually left Delhi this morning at 2:00 a.m. All went well. There was plenty of time in Amsterdam, then on to Detroit. Many hours of sitting. Since Barbara had not checked luggage, she got through passport check and customs and security very quickly. She arrived home safely to be greeted at the airport by Melanie. Upon arriving home she enjoyed a big glass of water from the tap. I stayed on in Delhi to meet the birding group with which I would spend the next 3 weeks in India. I will be posting the results of that trip, with far more emphasis on the birds and with far less detail, than has gone into the preceding report. Several weeks have passed since I posted the third installment of our report of our trip to India earlier this year . Here is the fourth installment. Friday, January 29 One last look at the Taj Mahal from our balcony at the Oberoi. Then off by road and driver, Badel, to the deserted fortress at Fatehpur City, “City of Victory”. 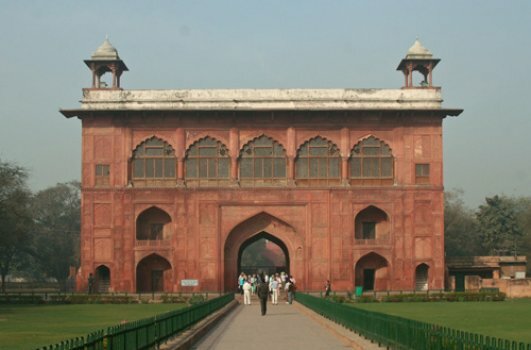 Built of red sandstone by Mughal Emperor Akbar for his three wives (one Muslim, one Hindu, and one Christian) and (far more numerous) harem, the biggest space by far was for the Hindu wife who finally bore him a son. We stopped in Bahratpur for lunch on the veranda of a hotel, and then went birding along a filthy canal with the AK representative who met us there, knowing I was interested in birds. 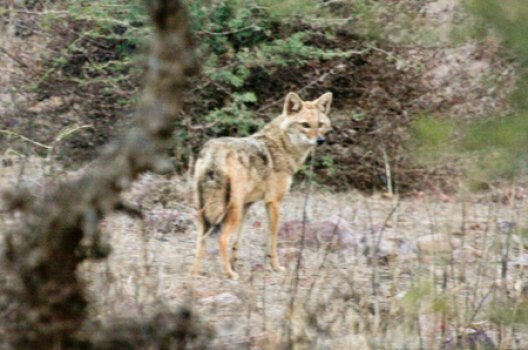 We enjoyed the train ride of about 4 hours from Bharatpur to our second Tiger Preserve, Ranthambore, south of Bharatpur in the State of Rajesthan. The first-class car in which we rode was very nice, but the other cars were greatly overloaded with passengers. We were instructed to get off at the 5th stop, a village near Ranthambore, but it wasn’t clear how many of what we experienced along the way were “stops”. The porter, however, took very good care of us and two other American couples traveling on their own to the same destination. 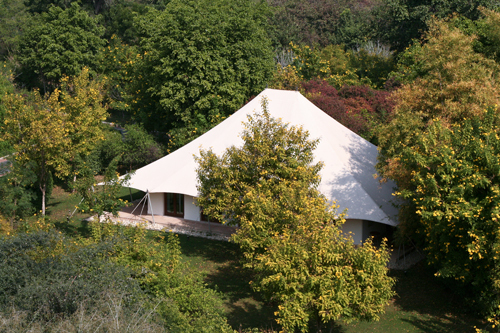 Late evening we arrive at the Oberoi Vanyavilas just outside Ranthambore. Oh my!! Such a fabulous place. Who could ever think that 3 nights in a “tent” could be so luxurious. It is like having our own house, with a few upgrades. (We later read in some travel literature that this hotel was rated number 2 in the world by Travel and Leisure Magazine). Dinner was served in an outdoor courtyard with a big fire pit in the middle. Tonight is full moon, clearly seen above the courtyard, together with Orion. It is like being in a fantasy world. Saturday, January 30 Tea and cookies are served in the lobby to tide us over the early morning game drive into the park. 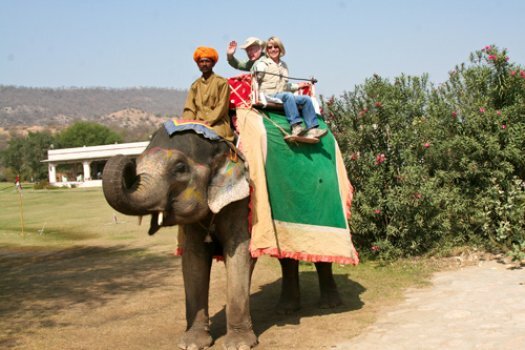 We start out at 6:15 with our Ranthambore guide, Najeef. He is a friend of Jagat, who was our guide at Bandhavgarh, and he is exuberantly proclaiming that he is a much better guide than Jagat. 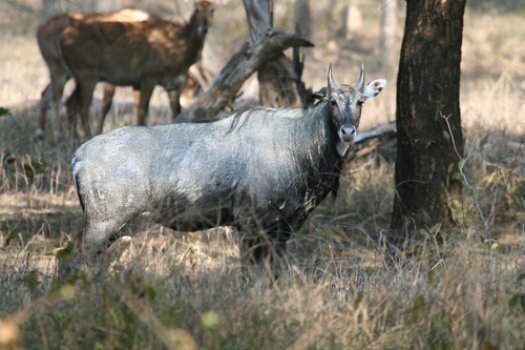 The morning drive does not produce a tiger, but many birds, spotted deer, Sambahr and Nilgai. Back for a yummy breakfast of French Toast filled with ham and cheese and topped with maple syrup and whipped cream. Out again in the afternoon, but still no tiger. I did not go on this game drive (the “roads” in the park are rough) because my back and knee were both giving me a lot of pain. 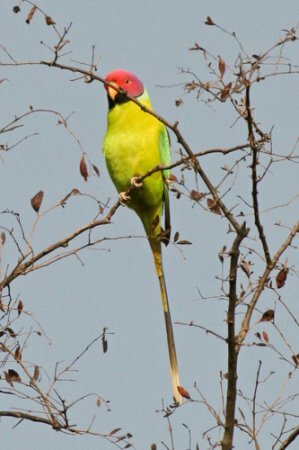 I enjoyed a quiet afternoon strolling around the grounds and finding a goodly number of new birds. We had another lovely dinner in the outdoor courtyard and retired early. Sunday, January 31 Dawn arrives with another beautiful day. Tea and cookies were served and then we were off to a different part of the park. We saw a really big, beautiful tiger right up close. He was moving quickly, so Barbara did not get a picture, but it was a scene that we will both always have in our minds. We also saw gazelles, a mongoose, and 2 golden jackals. A good morning! Relaxing time after breakfast and a shower. The afternoon game drive was another success with another tiger, this time a sleeping tigress. Such a beautiful animal! Back at the hotel we checked our email while having a “Manhattan”, which we concluded had been made from Scotch and Dry Vermouth, although we were assured the bartender really knew how to make Manhattans. We enjoyed another nice dinner in the courtyard and an early retirement. Monday, February 1 Up early for our last game drive. In addition to us, there was an Indian couple and two “buddies” of Najeef’s in the jeep. Crowded, and not as much fun as the other drives. No tiger. After breakfast and showers, we were off on the road to Jaipur with Badel at the wheel. It was hard to leave the Oberoi Vanyavillas-a fabulous place. 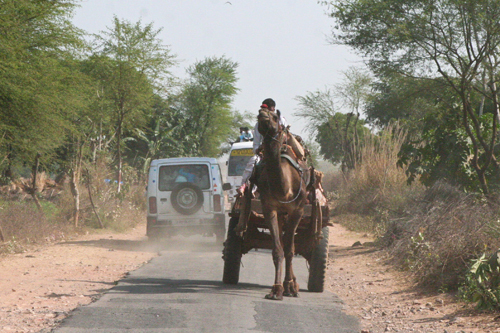 We drove through many more poor villages, differing somewhat from our experience to the east of Rajesthan in being drier, more desert-like, with lots of camels, farm tractors and home-made vehicles. The women were busy, hard in farming, while many of the men were sitting around visiting with each other or playing some sort of dice game. We arrived in Jaipur and our Trident Hotel, checked in, and went over tomorrow’s itinerary with the Jaipur AK representative. We could see the Water Palace from our balcony, so we walked over to the lake for photos and birding, with a little begging from kids, but not bad. As Barbara sat on the balcony to write our trip journal, a Rhesus Macaque monkey jumped up on the railing, much to her chagrin. We have been warned that these little creatures can be dangerous because they have become accustomed to humans giving them handouts, and when one doesn’t they may become aggressive. 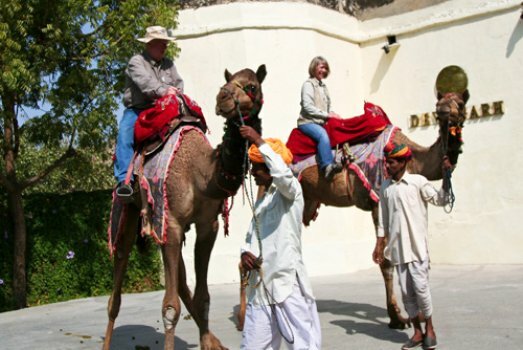 Tuesday, February 2 After a nice breakfast we were taken to Amber Fort by Badel and our Jaipur guide, Davindar. He was a very good guide, knowledgeable, good English, personable. 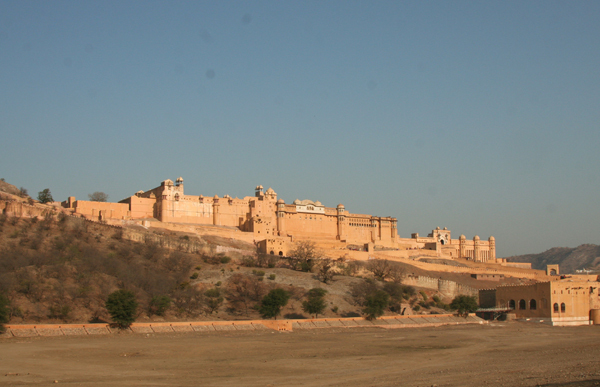 The Fort was once the capital of the state of Jaipur, until 1728. It is very large with a combination of Mughal and Rajput styles with frescoes, carvings and mirrored décor. We then stopped at a gem factory, and they showed us some beautiful stones in hopes that we would do some shopping. We went on to Deva Amer where we rode on an elephant through the wilderness area. We were a little nervous about it at first, but we both enjoyed the experience a lot. Nice lunch there. Back to the city to see Jantar Mantar, a fascinating outdoor observatory with large geometric structures for measuring time, celestial movements, etc. Then we moved on to City Palace to tour the museum and grounds. 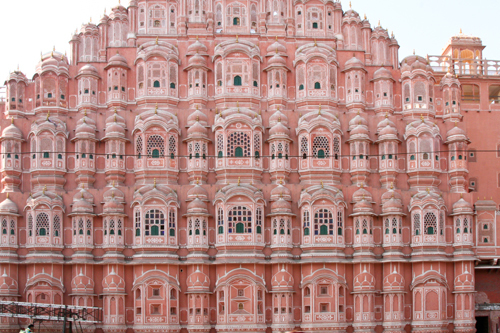 We stopped to take photos of Hawa Mahal, a red and pink sandstone façade built in 1789 for the women of the royal harem to look out one of the 953 small windows to see what was happening on the street below. Our last stop was to look at carpets and textiles. Barbara chose a fabric and pattern at 5:00 to be made into a blouse, and they delivered it to our hotel at 7:00 as promised. It fit perfectly. This was a very busy but enjoyable day. Wednesday, February 3 We got up at 4:40 to leave for the airport at 5:30 for our 7:00 flight to Udaipur. Everything went smoothly. 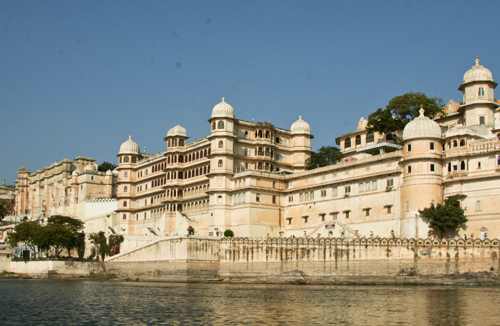 The AK representative in Udaipur took us to the Trident Hotel. Our beautiful room was ready early, so we had a chance to have breakfast before leaving to tour the City Palace where the Maharana family still lives. It is a huge palace begun 400 years ago and still being added onto. Then on to see the Crystal Gallery with the world’s largest collection of cut crystal. We stopped to see how miniature painting is done, but did not stay to see the “sales room”. We are getting a little tired of being “encouraged” to buy the local art. Back to the hotel for lunch and some rest before taking a boat ride on Lake Pichola to see the city from the lake. 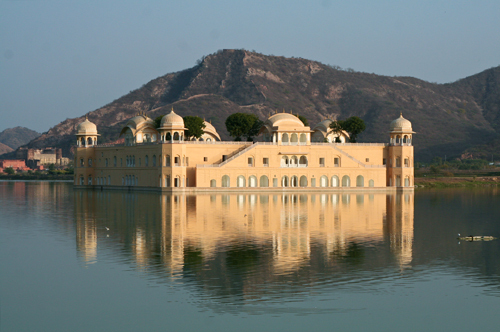 We stopped at an island palace where Mughal Shah Jahan, builder of the Taj Mahal, lived in exile from his father. Back to the hotel to walk around the beautiful grounds. So thirsty for a cold beer, but no alcohol is sold from January 31-February 4 due to elections. Thursday, February 4 More relaxing start this morning. We walked through the Garden of the Maids of Honor. Peaceful gardens, no fountains going due to major drought. Then on to Jagdish Temple, built by Maharana Jagat Singh in 1651. No photos were allowed. We left our shoes and socks outside. We bought marigold strands to leave as an offering at the huge black stone image of Vishnu. There were two priests reading scripture, and two men playing a drum and an accordion-type instrument. Being in this active temple was quite a moving experience. Our guide, Vic, is a Hindu and gave prayers. He gave himself and us a “third eye” of sandstone and saffron. From there we drove out of town to the old temples dedicated to Shiva. They were similar to those at Khajaraho, but not as many. We drove through the beautiful old Aravalle Hills to the 18th century Divi Garh Fort Palace high above the valley. We enjoyed a wonderful lunch there at their very contemporary white dining room. From there back to the entrance gate, we rode on camels. They laid down for us to mount up, then we were advised to hang on tight as they awkwardly got up, back-end first, nearly pitching us off over their heads. Camel rides are much bumpier than elephant rides, but a treat nonetheless. Back at the hotel we went birding and walking to the “sister hotel”, the Oberoi, and back.